Today I ran across two separate math articles from two different sources. Overall, it is a good read. I do not agree 100% with everything the article has to say. For example, I understand that it is a wise decision to transfer risk by purchasing certain types of insurance (such as term life insurance and homeowner’s insurance). The article does bring up the control factor of taxation and the national debt. That, I can certainly appreciate. You are not excused from math! It does not matter what you believe or don’t believe either side of politics. Unemployed or Out of Work? This was in my email inbox this morning. Why don’t we hear about this on the news??? ABBOTT: Good subject. Terrible times. It’s about 9%. COSTELLO: Right: 9% out of work. COSTELLO: If you’re out of work you’re unemployed. COSTELLO: But … They’re out of work! ABBOTT: Someone who doesn’t look for work can’t be counted with those who look for work. It wouldn’t be fair. COSTELLO: But they’re ALL out of work. ABBOTT: No, the unemployed are actively looking for work… Those who are out of work stopped looking. They gave up. If you give up, you’re no longer in the ranks of the unemployed. COSTELLO: The unemployment goes down just because you don’t look for work? ABBOTT: Absolutely it goes down. That’s how you get to 9%. Otherwise it would be 16%. You don’t want to read about 16% unemployment do ya? COSTELLO: That would be frightening. And now you know why Pres Obama’s unemployment figures are improving. Author StuartPosted on 2012-02-03 Categories Business, Economics, Humor, Mailbag, PoliticsTags economics, unemploymentLeave a comment on Unemployed or Out of Work? This lovely joke ended up in my inbox today courtesy of my friend Dave. It’s a slow day in the small town of Pumphandle, TN and the streets are deserted. Times are tough, everybody is in debt, and everybody is living on credit. As soon as he walks upstairs, the motel owner grabs the bill and runs next door to pay his debt to the butcher. The pig farmer takes the $100 and heads off to pay his bill to his supplier, the Co-op. The guy at the Co-op takes the $100 and runs to pay his debt to the local prostitute, who has also been facing hard times and has had to offer her “services” on credit. The hotel proprietor then places the $100 back on the counter so the traveler will not suspect anything. At that moment the traveler comes down the stairs, states that the rooms are not satisfactory, picks up the $100 bill and leaves. No one produced anything. No one earned anything. However, the whole town now thinks that they are out of debt and there is a false atmosphere of optimism and glee. And that, my friends, is how a “stimulus package” works! How would you have responded to this email I received? Comment and I will compile the list and send it back to them. I hope this email finds you well. I am ###### ####### and I am with the Virginia Department of Business. I am contacting you in response to some comments you left when responding to our recent survey. You comment said that you have too many comments and suggestions to list. Here at the Virginia DBA we would like to hear them. The Commonwealth is looking everywhere we can for ideas that will help get people back to work. The one thing that I ask is that when you send us your ideas make sure to select “reply all” to this email so that it will also go to our Director of Business Information Services, ##### #######. Thanks and I look forward to hearing from you. So let’s analyze this for just a minute. 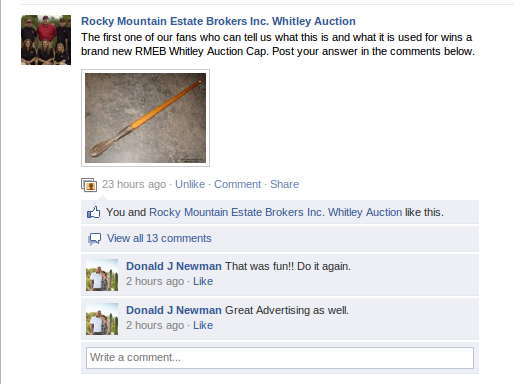 First: Click here and “Like” Mr. Whitley’s company fan page. Second: Click here and “Like” Mr. Rasmus’ company fan page. Why the second one? You’ll find out soon! Stay tuned.